I his species has the short legs, heavy bill, and large head of a roller (seepp. 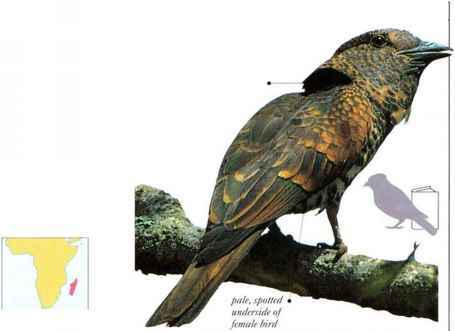 ¿¿6-£27), but with its long wings and tail it has a slight resemblance to a cuckoo (seepp. IS8-1VI). 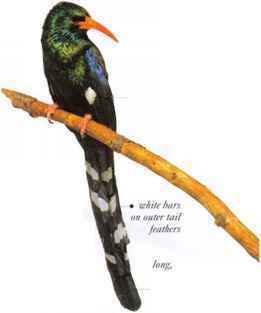 A bird of tropical forest and open woodland, it feeds on insects, particularly hairy caterpillars, and also takes chameleons. Liquid whistling notes arc uttered from a perch, or in circling flight over the territory. "» NEST A hole in a tree. • DISTRIBUTION Madagascar. Hoopoe l nmistakable with its bold coloring and crest, the I loopoe has stripes that, like those of a zebra, merge into the background when seen at a distance. It feeds mostly on the ground, probing for insects and small lizards. The call is a soft, repeated "hoop" sound. • DISTKIIUITION Eurasia, Africa, and Madagascar. Northern populations winter in tropical Africa, India, and S.E. Asia. 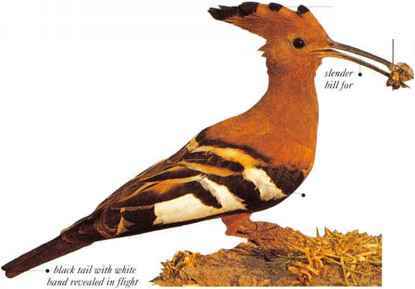 • REMARK Hoopoes breeding south of the Sahara are sometimes regarded as a separate species. Adapted for clambering on tree trunks and branches, this species has short, strong legs and sharp claws for gripping bark firmly. The long, graduated tail with a white bar near the feather tips is used, either closed or spread, as a support. In flight a white wing bar is revealed. 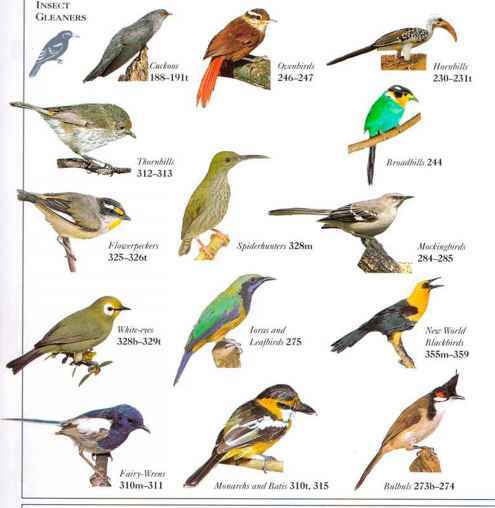 This bird occurs wherever there arc large trees except in thick rain forest, individuals following each other in single file in short flights from one tree to another. Green Wood-Iloopoes probe into crevices and holes with their long, slender, slightly curved bills, feeding on insects and other invertebrates, together with some fruit such as berries. This species is sociable and lives in small parties of up to 16 individuals, which are noisy with loud, cackling calls. These are frequently used in social display in which several birds perform a rapid, exaggerated bowing movement, vigorously flexing the tail up and down. Other members of the party help a dominant pair by feeding the incubating female and the nestlings when hatched. • NEST A natural cavity in a tree, or an old woodpecker hole, up to 72 ft (22 m) above the ground. • DlSTKIIU ITION Africa south of the Sahara.